Good job on those cupcakes, Melissa! My daughter's birthday is Friday, and she's chosen to have an "ice cream social" birthday party. Now I have to not only make ice cream, but buy a whole bunch of fun toppings, and come up with some kind of ice cream games. They don't allow homebaked treats at school, so I'm off the hook there. When I asked if she wanted a cake, too, since the whole theme of the party is ice cream, she said, "Of course!". 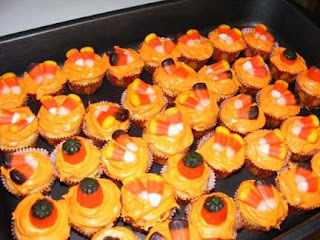 I think I'll make the cupcakes in the ice cream cones and call that the cake. I'm surprised they allow unwrapped treats at your school. Not allowed here in California. Maybe you guys have less weirdos out there? I think they are adorable and laughed when I saw that you had allowed yourself to buy themed? liners this year. I feel the same way. What? Adorable liners! I think we can get by without those! Those are like 2.00. And I actually think we can skip the cupcakes too. Ahhhh ... the class won't remember next year who did or did not bring treats. I used to spend like crazy on treats for other kids, the teachers ... go to the party supply store for those adorable little cellophane bags which would have to have beautiful sparkly wrapped candies in them ... looking back I can't believe how much I used to spend back when I thought I had money. I sure have changed my money management "type" for the better. Now I look at those things and can't even BELIEVE I used to buy them. For one, they are expensive. For TWO, they are FATTENING! All sugar. I kind of made this comment all about ME, huh? Hmmmmm. What does that tell me about myself? EXCELLENT CUPCAKES MELISSA! And excellent mothering by the way. AM's favorite breakfast, you taking the time to go and have lunch with her, you helping out your family with the food vending. I really DO say you rock! And your writing style is DANG entertaining.